How does ASP.NET AJAX implement browser detection? How to call the above browser detection code? The feature testing method is preferable over the browser detection, unless, you absolutely want to support only, say, IE and FireFox and don’t care about others. In some situations (like a custom control, for example) a particular browser supports 90% of what your piece of code wants, but there are these couple of important things you want are missing in that browser. Following is the short and sweet piece of code that ASP.NET AJAX uses in its client-side libraries to store the basic information about the browser. 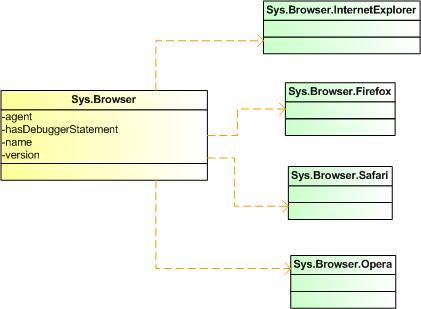 As shown in Listing 2, you can check the agent property of Sys.Browser object. The function IsIE() returns true if the browser is Internet Explorer, and false otherwise. This could be useful in a few cases, because in a few cases IE behaves differently from most other browsers. // Returns true if the browser is Internet Explorer. The code in Listing 3 uses different piece of code for different browsers (basically IE and all others). Typically, you want to check for the features as opposed to checking for the browser. However, in some cases (bugs, strange or incompatible behaviors in the browsers, etc.) browser specific code becomes necessary. How does an MS AJAX extender control get initialized on the client side? This article lists the important User-Agent strings (i.e. the IDs of the browsers that contact your web server). You can use these strings to do quick tests of accessing your site via tools like Fiddler.